"Ira's New Car" oil on canvas 24 x 36, sold. "Reflections" oil on canvas 24 x 30, sold. "Truck in the Weeds, Lazy Creek Winery, Anderson Valley" oil on birch panel 40 x 48, sold. "All Primed and Ready to Go" oil on canvas 22 x 28, sold. "Old School" oil on canvas 24 x 30. "Beyond Retirement, Rancho Camulos" oil on canvas 40 x 50, sold. "Reflections on a Cobra" oil on canvas 22 x 28, sold. "Resting in the Shade" oil on canvas 34 x 42, sold. "Old but not Forgotten" oil on canvas 48 x 60, sold. "Cooper, Camping" oil on panel 16 x 20, sold. "Charley the Surf Dog" oil on canvas 22 x 28, sold. 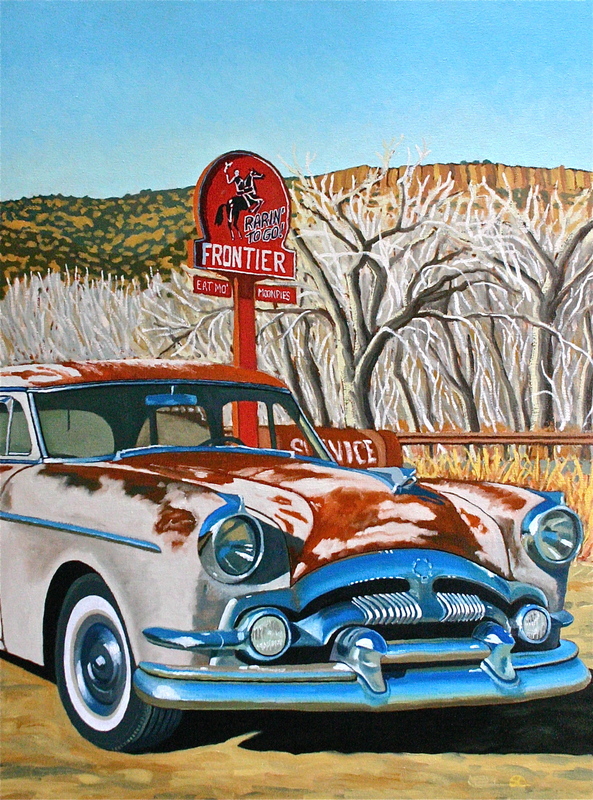 "Bud's Cool Ride" oil on canvas 20 x 24, sold. "Spyder by the Sea" oil on canvas 24 x 36, sold. "Ken's Targa" oil on canvas 24 x 36, sold.